The evolution of the Greek flag from the pre-Revolutionary years to the Second World War. Flags of the pre-Revolutionary period, which were raised by regional revolutionary forces in the first year of the Struggle for Independence. 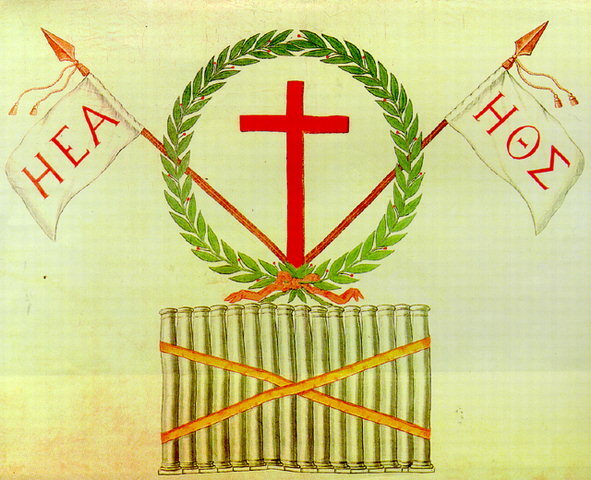 The flag of G. Sisinis with symbols from the Philiki Etaireia (The Society of Friends), and the emblem of the struggle Eleftheria I Thanatos (Liberty or Death). This is the only flag surviving from those first raised by the regional revolutionary bands.